You can imagine I have quite the collection of Big Red Beard Combs, but one problem I have come across is where do I put them in the bathroom? Usually I lay them across my tin of Pomade but haven’t been able to given them a proper place. Until now. 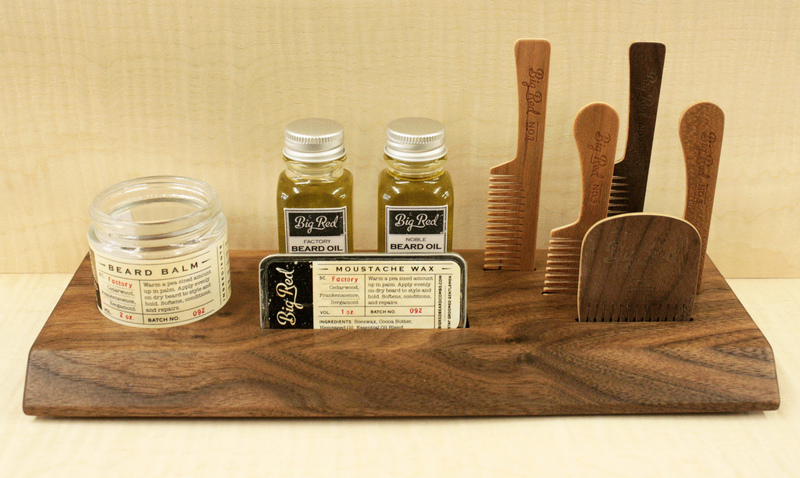 I went to the drawing board to create something to hold my Big Red Beard Combs and my other Big Red grooming products. Of course it had to be visually appealing and well designed, something that would display and look great in the bathroom. I decided to go with a low profile piece of Walnut with a chamfered edge (which will display the Big Red logo once complete). Simple slots are cut in the top to precisely fit each comb and grooming product. You may notice a few products in there that you haven’t seen yet. These are our – soon the be released – Moustache Wax and Beard Balm. The final product was something I’m proud to keep in my bathroom to display all my gear. In my opinion it is certainly an essential for any Beardsman. So we’ve decided to add the stand to the Big Red Beard Care line in the near future. We will be offering it 3 different configurations. Stay tuned for more updates! How Big are Big Red Beard Combs?